Drones or Unmanned Aerial Vehicles (UAVs) are used extensively by the military in Afghanistan. Some provide Full Motion Video feeds to operations centers providing intelligence on targets and insurgent movement. Other drones are armed and can hit insurgent targets. Most UAVs are fixed-wing, however, there are some rotary-wing UAVs such as the Northrop Grumman MQ-8 Fire Scout. Not only are UAVs used extensively in Afghanistan but drone operations are conducted in Pakistan as well. Terminology. Drones vs. UAVs? The words are used interchangeably around the world however in the U.S. military UAVs seems to be the official convention. 1. The Raven is used for battlefield surveillance to provide information to small units such as infantry platoons, companies, SFODAs, or SFAATs. At left is a Raven operator from the 2nd Cavalry Regiment training at JMRC in Hohenfels, Germany for a future Afghan rotation. The Raven is one of the smaller UAVs in use in Afghanistan. Photo by SPC Joshua Edwards. The United States Army has three types of drones in its inventory. The RQ-7 Shadow is the standard drone for the Brigade Combat Team (BCTs) and the seven Special Forces groups. In addition, the army also fields the MQ-5 Hunter and MQ-1C Gray Eagle. The Germans use the Heron Unmanned Aerial System in Afghanistan. It is operated by the German Air Force (Luftwaffe) out of Marzar-e-Sharif in northern Afghanistan. The Heron UAS delivers valuable intelligence and surveillance data to the Bundeswehr for the Resolute Support mission in Afghanistan. The UAS sends its real-time video feed via a satellite data link. 4. In December 2015 Insitu, Inc. (a subsidiary of Boeing) was awarded a $70M contract to supply the Afghan National Defense and Security Forces with eight ScanEagle unmanned aerial systems. 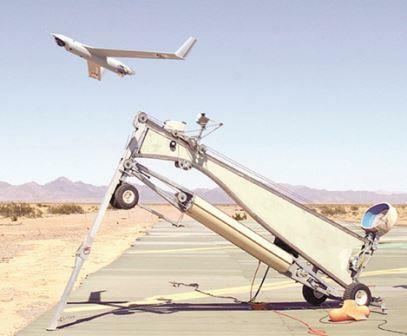 Read more about the ScanEagle UAS. Greene, Robert R. and Megan L. Dove-Steinkamp. "Finding Meaning Inside the Box: Understanding RPA Crew Resilience", Small Wars Journal, September 10, 2015. Mahmood, Dr Amna, Dr Sadaf Farooq, and Asia Karim. "US Drone Attacks in Pakistan: An International Law Perspective", International Journal of Business and Social Science, Vol. 6, No. 6, June 2015. GAO, Unmanned Aerial Systems: Actions Needed to Improve DoD Pilot Training, Government Accountability Office, GAO-15-461, May 14, 2015. Abizaid, General John P. and Rosa Brooks, Recommendations and Report of the Task Force on US Drone Policy, The Stimson Center, June 2014. Zenko, Micah and Sarah Kreps, Limiting Armed Drone Proliferation, Council on Foreign Relations Special Report, June 2014. Davis, Lynn E. et al. Armed and Dangerous? UAVs and U.S. Security. RAND Corporation, May 2014. Paper examines whether drones are transformative weapons, asks if they will proliferate and create global security dangers, questions if an arms control agreement is needed for drones, and how the U.S. can influence future use of armed drones by others. DoD. Unmanned Systems Integrated Roadmap, FY2013-2038, December 2014. Provides the way ahead for training, procurement, and employment of UAS. Walsh, Dr. James Igoe. The Effectiveness of Drone Strikes in Counterinsurgency and Counterterrorism Campaigns, United States Army War College Strategic Studies Institute, September 2013. White House, U.S. Policy Standards and Procedures for the Use of Force in Counterterrorism Operations Outside the United States and Areas of Active Hostilities, a fact sheet released by the White House, May 23, 2013. Sarah E. Kreps and John Kaag. The Use of Unmanned Aerial Vehicles in Contemporary Conflict: A Legal and Ethical Analysis. Social Science Research Network, March 15, 2012. Two writers criticize the use of drones on the grounds that they do not meet international standards of distinction and proportionality. Accessed here on July 30, 2012. "4 Forgotten Facts About Combat UAVs". Popular Mechanics, September 2009. "Fact Sheet - Unmanned Aircraft Systems (UAS)". FAA.gov, December 1, 2010. Predator Drones and Unmanned Aerial Vehicles (UAVs). New York Times reference page. "How the Predator UAV Works". HowStuffWorks.com. MQ-9 REAPER. The USAF Fact Sheet on the Reaper. RQ-11B RAVEN. The USAF Fact Sheet on the Raven. RQ-4 Global Hawk. The USAF Fact Sheet on the Global Hawk. RQ-170 Sentinel. The USAF Fact Sheet on the Sentinel. See more about the RQ-170 at WikipediA here. U.S. Drones over the Middle East Region. USA Today provides a graphic depicting the characteristics of the MQ-1B Predator and the MQ-9 Reaper; estimates of number of missions in Pakistan, Yemen, and Somalia; and number of civilian casualties. Drones. By ProCon.org. This website provides information, background, history, and facts about drones. It presents the pro and con arguments associated with the drone debate. Unmanned Warfare Information Repository. Office of Secretary of Defense. This is a common access card-protected site. Many of the UAVs such as the Predator and Reaper that are employed overseas are flown by "pilots" based at Creech Air Force Base. The UAVs take off and land from places like Kandahar and Bagram but are controlled from USAF bases in the United States. Unmanned Aerial Vehicle. Wikipedia.org, The Online Encyclopedia. Civilian Casualties. Many times drone attacks take place on buildings where civilians are located. It is difficult for a drone targeter / operator to see inside the building to determine who is actually there. While there may be good intel providing the location of a legitimate target (SIGINT, HUMINT, etc.) that does not mean that the target is not in a building with women and children. Friendly Fire. Incidents of friendly fire (whether ISAF or ANSF personnel are wounded or killed) do happen in all wars. Drones are not exempt from friendly fire incidents. As recent as March 2014 the United States has killed ANSF personnel in friendly fire incidents involving drones. 2. Diminished Intelligence. While armed drone attacks against high-level insurgents and terrorists have been effective in targeting the senior leadership of insurgent and terrorist organizations (at least for a short-term period) there is a diminished ability to collect intelligence. When a high-level target is killed he can't be interogated for information. Read more on this issue in "Dead Men Share No Secrets", The New York Times, by Marisa L. Porges at this link. Overworked Drone Fleet and Airmen. The U.S. Air Force was slow to respond to the need for UAV coverage in Iraq and Afghanistan. It was only after some prodding by then Defense Secretary Robert Gates that the USAF increased its drone fleet and capability. In 2015 the Air Force had the ability to conduct up to 60 combat air patrols (using UAVs) around the world which was a huge increase from the early 2000s. 3. However, even that level of capability was not considered enough for the end-users on the ground. Training of Military Drone Pilots. Both the U.S. Army and the U.S. Air Force are having difficulties in fielding a properly trained UAS force. A Government Accountability Office (GAO) study released on May 14, 2015 (GAO-15-461) found that there were deficiencies in their respective training programs and the instructor base was insufficiently manned and underqualified. This had an effect on the overall quality of the drone unit personnel, their training status, and the numbers of personnel in the drone units. March 5, 2016. "Obama to release drone playbook", Politico.eu. June 5, 2015. "US Army Mulls Merging Drone Training after Scathing Audit". Defense Tech. It found that the Shadow drone units are very undertrained. May 1, 2015. Sudden Justice: America's Secret Drone Wars, New America. Chris Woods, a widely-published journalist focused on conflict and national security issues, is interviewed by Peter Bergen about his most recent book. (YouTube.com, 1 hr 6 mins). April 25, 2015. "Deep Support in Washington for C.I.A. 's Drone Missions". The New York Times. Congress leaders support the agency's drone attack program. April 11, 2015. "Armchair killers: life as a drone pilot", The Telegraph. A review of the film "Good Kill" and a conversation with a former drone pilot. April 10, 2015. "Good Kill: Tackling the ethics of drone warfare on film", BBC News. Actor Ethan Hawke and director Andrew Niccol discuss their latest film, Good Kill, about an Air Force drone pilot who begins to question the ethics of his job. April 10, 2015. "Good Kill review: more of a conversation piece than a fully formed film". The Irish Times. March 11, 2015. "A gripping glimpse into bin Laden's decline and fall". By Peter Bergen, CNN National Security Analyst - CNN News. Bergen's article says that recent documents recovered from al Qaeda show just how devastating the CIA drone war was on the terrorist group. January 4, 2015. "Exclusive: U.S. Drone Fleet at 'Breaking Point', Air Force Says". The Daily Beast. November 24, 2014. The History of the Drone in 9 Minutes. Popular Science. September 16, 2014. Do Drones Work? Georgetown University Center for Security Studies Professors Daniel Byman, Christine Fair, and Christoper Swift discuss the United States' use of drones in presecuting the war on terrorism. The panelists discuss issues surrounding the drone program, including its efficacy, legality, and future use. 2013. "Unmanned: America's Drone Wars". Brave New Films. An alternative view of the drone war over Pakistan focusing on the human cost of the war; not the benefits of killing high-level leaders of terrorist and insurgent organizations. April 1, 2012. Predator UAV Crash Recovery Mission in Afghanistan. YouTube. October 15, 2011. USMC RQ-7B UAV landings in Afghanistan. YouTube. November 2008. "Unmanned Aerial Vehicles Used by Coalition". YouTube. RQ-4 Global Hawk. U.S. Air Force on Flickr.com. November 12, 2017. "Avengers in Wrath: Moral Agency and Trauma Prevention for Remote Warriors", Lawfare Blog. December 17, 2016. "The evolution of the combat RPA", U.S. Air Force. A history of the remotely piloted aircraft used by the USAF. April 24, 2016. "A Categorical Error: Rethinking 'Drones' as an Analytical Category for Security Policy", by Dave Blair, Lawfare Blog. The author advocates classifying drones by mission set versus how they are controlled and piloted. March 2, 2016. "Less Money More Action for SOCOM Drones", Stars and Stripes. February 8, 2016. "Jalalabad Predators provide 24/7 overwatch in Afghanistan", Khaama Press. 62nd ERS Squadron. November 27, 2015. "RPA officer incentive pay to increase to $35K under new law", Air Force Times. The action is part of the 2016 National Defense Authorization Act. November 27, 2015. "Air Force hires civilian drone pilots for combat patrols; critics question legality", Los Angeles Times. November 19, 2015. "Death From Above: Confessions of a Killer Drone Operator", Newsweek. November 14, 2015. "Terror Suspects Are Frequent Targets of U.S. Drones". NBC News. November 8, 2015. "Targeting Killings, Drones, and the Myth of Precision", by Scott N. Romaniuk, Geopolitical Monitor. November 5, 2015. "Details of Drones, From a Pilot Who Flew Them", National Public Radio. An interview with a retired Air Force Lt Col who wrote the tactical manual for the Predator and who flew drones from 2003 to 2012. October 27, 2015. "The Drone Papers: Intercepting the Nonsense", Lawfare Blog. September 28, 2015. "Enlisted drone pilots? Decision expected early next year". Air Force Times. The Air Force is struggling to keep up with the demand for drone pilots and this solution is attractive; but it comes with a host of complicating factors. August 24, 2015. "Reapers, Predators on the prowl in Afghanistan". USAF News. July 30, 2015. "When you mess up, people die: civilians who are drone pilots' extra eyes", The Guardian. June 2, 2015. "How the Drone Age Came to Pakistan". By Dr. Charles G. Cogan, The Huffington Post. The writer points out that attempts to transfer drone strikes from the CIA to the DoD will put cooperation with Pakistan's ISI in jeapardy. May 31, 2015. "The Turf War Launched by America's First Drone Strike is Still Raging". By Chris Woods, Defense One. In late 2001 a botched attempt by the CIA to kill Mulllah Omar infuriated the Air Force. May 19, 2015. "IG report, requested in 2011, blames Air Force for drone cost overruns." Stars and Stripes. The Global Hawk program was run badly by Air Force project officers. May 19, 2015. "Meet the US Military's New Army of Mini-Drones." The Diplomat. A tiny new drone developed by the Naval Research Laboratory could be used to detect enemy submarines. The Close-In Covert Autonomous Disposable Aircraft (CICADA) can be deployed at a very low cost. May 15, 2015. "What 'Good Kill' Gets Wrong about Drone Warfare". Newsweek. April 24, 2015. "The Hidden Cost of Drone Combat: Soldier's Mental Health", Harvard Law School National Security Journal. April 16, 2015. "A Drone Has Never Linked Up With A Tanker Until Now". By Joseph Trevithick, War is Boring. A navy drone sucessfully gets refueled in the air. February 17, 2015. "Armed Drone Myth 1: They Will Transform How War Is Waged Globally". The RAND Blog. December 19, 2014. "Drone strikes counterproductive, says secret CIA report". The Sydney Morning Herald. WikiLeaks has published a classified CIA report. November 21, 2014. "Drone pilots train at Holloman Air Force Base". KOAT.com. November 21, 2014. "The US Just Launched Its 500th Drone Strike". Defense One. November 24, 2014. "The Unblinking Stare". The New Yorker. Steve Coll provides a comprehensive review of the history, process, and issues about drone strikes. November 20, 2014. "Drone Strikes Never Kill 'Humans'". The Atlantic. The author, Conor Friedersdorf, thinks that news organizations should stop reporting that 'militants' were killed when they can not confirm the information. November 18, 2014. "British Army praises performance of Watchkeeper during debut deployment". Flight Global News. November 12, 2014. "Obama's Deadly Informants: The Drone Spotters of Pakistan". The Daily Beast. Article provides info on the collusion between the intelligence services of Pakistan and the "Good Taliban" as well as the counterintelligence campaign by the insurgents against the informants that provide info on drone targets. October 20, 2014. "Ex-US Navy fighter pilot MIT prof: Drones beat humans - I should know". The A Register. October 20, 2014. "Pakistan-US: Death from the Skies - Analysis". Eurasia Review. October 7, 2014. "Stop Pretending Drone Warfare is Casualty-Free for American". Time.com. October 6, 2014. 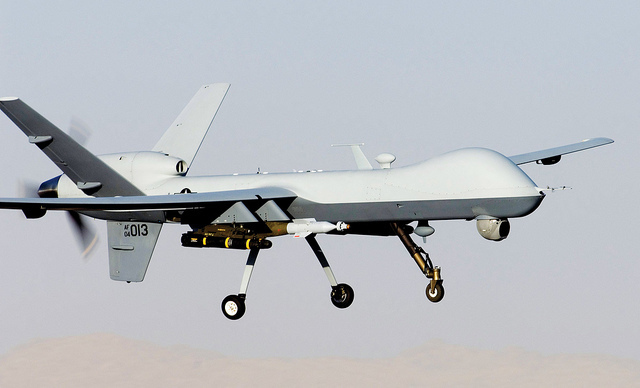 "Rise of the Reapers: A Brief History of Drones". Global Research. Article by Chris Cole provides a brief history of drones from the beginnings to now. September 27, 2014. "New flight plan on drones". The Boston Globe. By Katharine Whittemore. The writer explores the different aspects of drones through several books she has read. June 14, 2014. "US Drone Strikes Resume in Pakistan for the First Time in Six Months". The Diplomat. June 4, 2014. "A Rare Look Inside the Air Force's Drone Training Classroom". The Atlantic. The technology of war is changing, but the fundamental conflict is the same. May 29, 2014. "CIA Winds Down Drone Strike Program in Pakistan". ABC News. April 10, 2014. "We Can Do Better: Droning about Drones". Cornell Sun Blog. The author presents a weak argument against the use of drones. March 10, 2014. "The Escalation of Drone Warfare in Afghanistan, Pakistan, and Africa". Centre for Global Research. March 4, 2014. "The End of Drone War?". The American Conservative. December 30, 2013. "America's Love Affair With 'Technowar'". History News Network. This article examines why President Obama favors the 'drone war' as a means to fight the 'War on Terror'. December 20, 2014. "Norway Provides Intelligence for Drone Attacks". The Nordic Page. The provision of intel is a normal part of the NATO partnership but some sectors of society protest the practice. December 19, 2013. "ProCon.org Launches New Website on America's Use of Drones in the War on Terror". ProCon.org. December 18, 2013. "Britain's military drone base opens its doors for cameras for first time". The Telegraph. The base in Lincolnshire operates UAVs in Afghanistan. December 18, 2013. "Drones and the indefensible". The Guardian. The writers condemn the use of drones by the US and Britain for killing innocent people. October 22, 2013. "U.S. covert drone program has violated international law, reports say". Foreign Poicy AFPAK Channel. Both Amnesty International and Human Rights Watch have release reports that have investigated the covert U.S. drone program highlighting civilian deaths. October 25, 2013. "Report: U.S.-Pakistan Cooperated on Drones". Radio Free Europe. Newly revealed secret documents show that Islamabad had endorsed CIA drone attacks in Pakistan's northwestern tribal areas. September 17, 2013. "Is The U.S. Drone Program Fatally Flawed?" NPR.com. September 5, 2013. "A History of the World's First Drone War". History News Network. September 2, 2013. "These Powerful Visualizations Show The Scope of the US Drone War". San Francisco Chronicle. Graphics provide data on drone use in war. August 22, 2013. "Cottonbalers, Mustangs team up to protect Soldiers with unmanned aerial systems". DVIDS. The Puma and Raven SUAS fly to detect IDF attacks at FOB Shank. July 26, 2013. "The Drone Gender Gap: Big Differences in How Men and Women View Strikes". Danger Room on Wired.com. Article based on Pew Research Center Report. March 14, 2013. "History Tuesday: The Origin of the term Drone". Defense News. March 9, 2013. "Air Force reportedly removes drone strike data from website". Fox. February 22, 2013. "Drone Pilots are found to get Stress Disorders Much as Those in Combat Do". The New York Times. February 19, 2013. "More Afghan civilians killed by drones in 2012, U.N. says". CBS. December 6, 2012. "2012 Was the Year of the Drone in Afghanistan". Danger Room at Wired.com. November 9, 2012. "Drone War in Afghanistan Peaks as Human Troops Withdraw". Danger Room Wired.com. August 2, 2012. "Drone warfare: a new generation of deadly unmanned weapons". The Guardian. July 29, 2012. "A Day Job Waiting for a Kill Shot a World Away". The New York Times. July 29, 2012. "A Day in the Life of A Drone Operator". The Atlantic. July 22, 2012. "The Moral Hazard of Drones". The New York Times. July 19, 2012. "Are Drones a Superior Form of Warfare?" The New York Times. June 28, 2012. "French Have Lost 12 Sperwar UAVs in Afghanistan". Defense News. June 19, 2012. "UAVs Could Become Even More Prevalent in Afghanistan, Pakistan". Aviation Week. May 9, 2012. "U.S. Marines Extend Afghan Deployment of Cargo UAV". Flight Global. April 22, 2012. "Ravens, Mini-UAVs Winning Gold in Afghanistan's "Commando Olympics"". Defense Industry Daily. April 6, 2012. 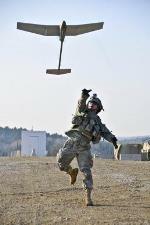 "Army moving slowly on cargo UAV program". Army Times. February 15, 2012. "Air Force Buys Fewer Drones - But Ups Drone Flights". Danger Room Wired.com. January 30, 2012. "Report: UAV can't fly in Afghanistan heat". Marine Corps Times. January 12, 2012. "Armed UAV Operations 10 Years On". STRATFOR. December 12, 2011. "CIA's Drone War in Pakistan Will Use Afghan Bases". Wired.com Danger Room. October 25, 2011. 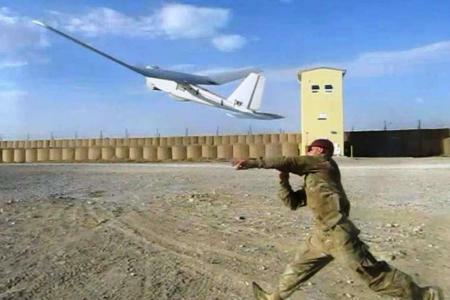 "UAVs reaping benefits in Afghanistan". UK Ministry of Defence. July 13, 2011. "Marine Corps UAVs get new home in Afghanistan". Marines.mil. June 26, 2011. "The New U.S. 'Smalls' Air Force Over Afghanistan". Time.com. June 24, 2011. "Army Surging Hundreds of Small UAV's to Afghanistan". Aviation Week. June 19, 2011. "War Evolves With Drones, Some Tiny as Bugs". The New York Times. April 21, 2011. "Fire Scout UAVs bound for Afghanistan". Navy Times. March 1, 2011. "MoD seeks toy-size spy drones for Afghanistan". The Guardian. December 16, 2010. "Army: Tremendous demand for UAVs in Afghanistan". Army Times. February 7, 2010. "RAF relying on Drones in Afghanistan". The Guardian. January 14, 2010. "Australia launches Afghan operations with Heron UAV". Flight Global. December 1, 2009. "Sighted: A Secret US Aircraft in Afghanistan". Popular Science. March 16, 2009. "Drones are Weapons of Choice Fighting Al Qaeda". The New York Times. 1. The controversy over the name - drones vs. UAV - has to do with a perceived negative perception associated with the word drone. Therefore a big argument as to what to call drones or UAVs. Read more in "Just Call It a Drone", Forbes.com, March 2, 2013. See also "History Tuesday: The Origin of the term Drone", Defense News, May 15, 2013.
http://blogs.defensenews.com/ . . . /the-origin-of-drone . . .
2. For an example of a friendly fire incident involving a drone (five ANSF personnel killed) see "ISAF statement on Logar incident", DVIDS, March 6, 2014 and "Five Afghan soldiers killed in NATO strike", BBC News Asia, March 6, 2014. 3. For the number of drone CAPs over the years see a chart in "Air Force Trims Drone Ops to Get Workforce 'Healthy'", Defense One, May 18, 2015. 4. For more on the Heron read "Heron 1 Chalks Up 25,000 Flight Hours in Afghanistan", ASDNews, November 27, 2015.